We were given the mealworms and Styrofoam as a project. Our job was to analyze data every class (Thursdays) with a scale to see how much of the styrofoam was eaten. One challenge we faced was to keep the worms alive since many of them died within days after we gotten them. In total, we had 69 mealworms but by the next class, it seemed like half of them had died. Over the three consecutive weeks, the worms got fewer and fewer. 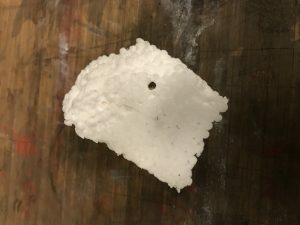 According to our data, we realized that there have been large holes in the white styrofoam and not in the other Styrofoam. 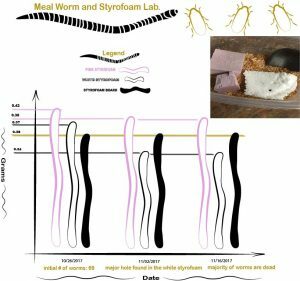 Indicating that the worms enjoyed eating the white ones because it is softer and easier to access, unlike the purple and black ones. I learned that this experiment with the mealworms triggered my mind to think differently about these insects. Mealworms are not as liked by humans but they can do a fairly good job of getting rid of styrofoam. At the end of this project, I’ve noticed the amount of time it takes for the worms to eat the styrofoam and that these mealworms don’t only eat styrofoam but they also ate the carrots that I put in every week.